Dogs reach sexual maturity when they are about six months old. If you wish to prevent reproduction, you should choose to neuter before this important milestone. Once male pups are eight weeks old, it's likely that their testicles have fully descended, which is a necessary condition for performing the surgery. According to the ASPCA, spaying and neutering can occur as early as eight weeks. The ASPCA also recommends scheduling the neutering procedure before puppies reach sixth months of age, in order to avoid behavior problems associated with not neutering. Specific breed and the physical health/maturity of the puppy can also play a role in determining the most appropriate age to neuter. You may decide that you do not wish to neuter your dog after examining the pros and cons. Depending on where you live that can be a valid choice. However mandatory spay/neuter laws are being implemented in many cities and counties. Check with your local regulations to be sure. If you are adopting a dog from a shelter or rescue, you also will be restricted by their adoption contract from choosing not to neuter. In some cases, you may get a waiver if the dog has a medical condition where neutering is considered too risky, such as an older dog with a health condition. Many people are concerned that if they have their dog neutered too soon, the procedure will have a negative impact on his personality and physical development. Your veterinarian can help allay any fears you may have. There is also a long-running myth that neutering male dogs will cause them to stop being playful companions. Even though this myth has been perpetuated for years, it is simply not true. Playfulness is simply part of the canine nature. Your dog is likely to remain playful throughout his life regardless of whether he is neutered. While neutering can have an effect on your dog's behavior, especially if neutered young, it really depends on your individual dog and his breed and environment. Some dog owners believe neutering can "calm" a dog which could be an effect of reduction in hormones leading to less roaming behavior. It may also reduce aggression toward other dogs in cases where the issues are already a problem, or the potential is there. Some males exhibit aggressive behavior once they become sexually mature. Territorial marking can be another problematic issue which may occur in dogs that haven't been neutered. Dogs past sexual maturity are more likely to escape confinement and roam the neighborhood, which can lead to fighting. In some cases, early neutering can prevent these types of behaviors from becoming part of a dog's nature. However, it is not guaranteed to fix or prevent all possible behavior problems. Proper training is the best deterrent for unwanted behaviors. How Can I Be Sure My Dog Is Ready to Be Neutered? If you purchase your dog from a breeder, you'll know exactly how old your new pet is when you bring him or her home. This can be very beneficial when making decisions about when you should schedule the neutering procedure. The breeder can be an excellent source of information about the best way to care for the particular type of dog you have decided to add to your household. If you aren't planning to breed your pup, talk with the breeder about his or her thoughts on the best time to take care of getting your puppy neutered. Reputable breeders are knowledgeable about health and personality considerations for the particular breed they raise, so your breeder should be able to let you know if there are any breed-specific recommendations for your dog. Of course, not everyone purchases his or her dog from a breeder. If you adopt a stray dog or rescue an animal from a shelter, you won't have the advantage of knowing exactly how old your animal is. When you bring home a pound puppy, you aren't likely to know exactly how large he will be when fully grown. In this situation, it can even be difficult to judge the age of your dog based on his size since you don't have breed size standards for comparison. Luckily, most shelters take care of neutering before allowing pets to be adopted but do be sure to ask about it. What if your dog is older than six months of age and you are thinking of having him neutered? This can certainly be done although it generally better to have surgery when he is younger. Some research shows that there may be some advantages to your dog's health when neutering him after he has reached sexual maturity. 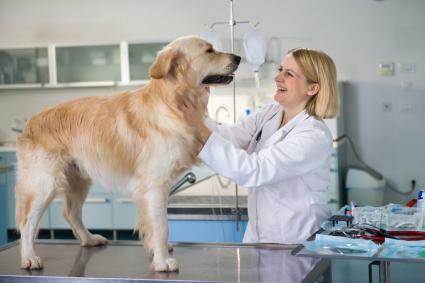 This study was performed using Golden Retrievers, so consult with your veterinarian about the latest information regarding whether your dog may benefit from neutering after twelve months of age. For female dogs, many spay/neuter advocates believe you should spay before their first heat. However, there is some evidence that female dogs have a higher risk of developing incontinence if spayed before their first heat due to changes in their estrogen. The best age to neuter an older dog will vary with your pet's breed and specific health status. A senior pet may develop heart disease, kidney disease, or other illnesses that could make anesthesia riskier, so it's best to have any elective surgery performed while your pet is still young. Older dogs are more likely to have complications after neutering, such as swelling and bleeding into the scrotum, increased pain, or increased likelihood of licking at their incisions. You can decrease these risks by having your pet neutered before six months of age. There is no age that is "too old" for your dog to be neutered but should be decided on a case-by-case basis with your veterinarian depending on your individual dog's health. Because larger and giant breeds of dogs take longer to mature and grow, some veterinarians and breeders recommend delaying neutering until the dog's growth plates have closed. It is speculated that larger dogs neutered early can develop issues with their musculoskeletal system because of the changes in their growth due to the change in hormones. As a result, your dog could be more likely to experience painful conditions like hip dysplasia. However, the evidence for this is inconclusive and there are pros and cons to waiting until your dog reaches maturity before neutering. When determining the best age to neuter a large breed dog, it's best to discuss with your veterinarian to discuss specific genetic conditions endemic to your breed to make an informed decision. You shouldn't worry about the neutering a dog procedure for most dogs as it's a very simple surgery. Your dog will be sedated with anesthesia via injection and the area around the groin is shaved down if necessary and cleaned. Your veterinarian will make a small incision by the scrotal sac and the testicles are removed through the incision. The area is then stitched closed. Dog neutering aftercare is luckily not complicated. When you bring your dog home from your veterinarian, they should give you a cone for your dog to wear to keep him from chewing on his stitches. He will probably be very sleepy which is a side effect of the anesthesia. Your dog should be awake and active within 24 hours of the surgery. Put your dog in a quiet, confined space to give him time to recuperate and keep other animals and children away. Your veterinarian may or may not give you pain medication. If you observe your dog straining and looking uncomfortable, contact your veterinarian about pain medication. While your dog should feel some pain, ideally he should be able to tolerate it well with some rest, quiet time and medication. Keep an eye on the incision area to look for swelling, redness or anything unusual. You will need to keep them dry and your dog should not bathe or swim for 10 days. If you see any other symptoms of concern, such as vomiting, refusal to eat, diarrhea, weakness or confusion, contact your veterinarian right away. Most dogs will be up and running around within a day of neutering surgery. If your dog isn't appearing active with his usual personality after 48 hours speak to your veterinarian. Your cost will vary depending on where you live and whether you use a full-service veterinarian or a low-cost spay/neuter clinic. Prices can range from about $45 to $135 for clinics and $200 to $400 for a full-service vet. You may also pay around $40 to $50 for blood work and $10 to $30 for pain medication. The cost of neutering is not dependent on the dog's age, but size, so if you have a large breed dog you may find that the prices will be higher for an adult dog versus a small puppy since they obviously have very different weights. The price also may be increased for medical conditions such as an undescended testicle Cryptorchidism), diabetes or obesity. Fortunately, your veterinarian can help you make an informed decision about the best age to neuter your individual pet. When you take your puppy to the veterinarian to complete his or her shots, discuss your concerns about the best age to neuter him. 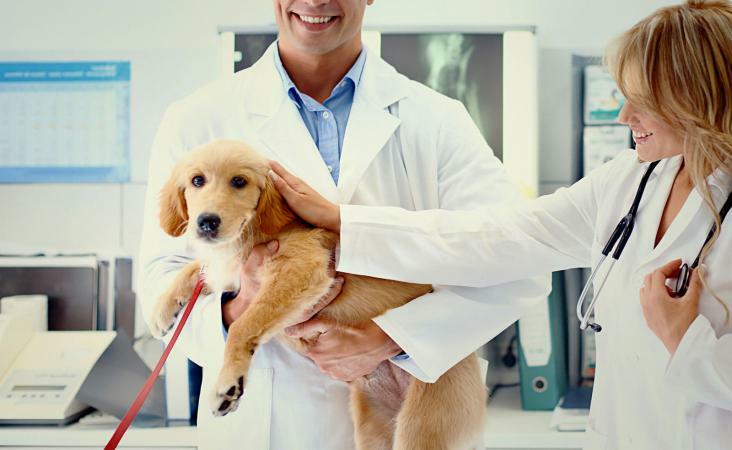 Whether your dog is a purebred or a foundling mixed breed, your veterinary health professional is the best resource for all types of healthcare information.